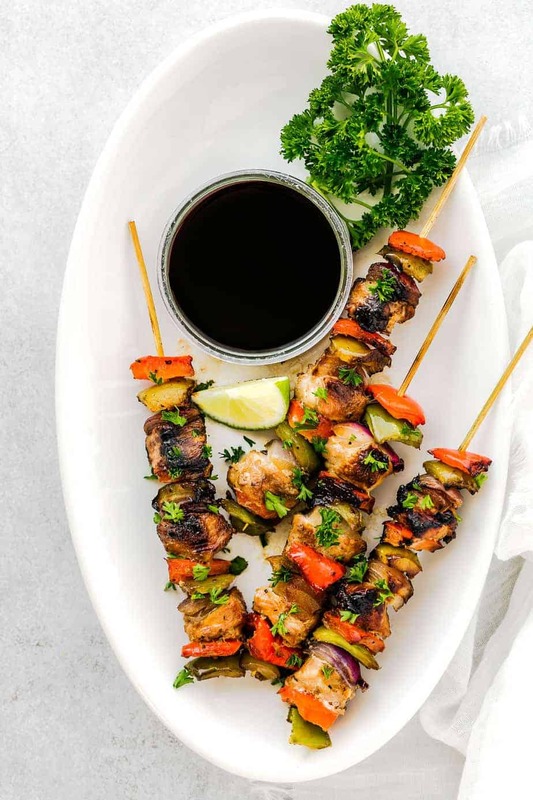 Try this best chicken kabob recipe for your next grilling or bbq party! The chicken meat is so tender and juicy, marinated in delicious homemade sauce: soy sauce, honey, garlic, coriander seeds and black pepper. 4 skinless boneless chicken breast - cut into small bite pieces (about 1 inch cubes). In a large mixing bowl, whisk together oil, honey, soy sauce, coriander, ginger, black pepper and garlic. Reserve a small amount of marinade for basting, so the basting sauce doesn't touch any raw poultry. Place the chicken, red bell peppers, green bell peppers, red onion in the bowl. Marinate in the refrigerator for at least 2 hours or overnight! To prevent wood skewers from burning, soak them in water for 1 hour or overnight before using them. Remove chicken from marinade and thread onto wooden skewers. Lightly oil the grill. Place the skewers on the grill and cook the chicken satay for about 4 - 5 minutes per side or until cooked. Turning and brushing kabobs with reserved marinade sauce frequently. My kids love kabobs! Eating anything off of a stick automatically makes it taste better. These sound awesome. We love making chicken kabobs. So many different veggies to make and use when putting these together. Pair it with some rice and all set. Those look so good! I can’t wait until my son gets the grill ready for the season! I love making any kind of kabob. It’s a great way to grilled food and give you different flavors. I can’t wait to try that looks delicious. It’s gorgeous and fresh looking! My husband once made up a party food them of “food on a stick.” People loved it. I’m going to suggest this recipe for our next BBQ. I just ate some chicken kebobs yesterday, but they were lacking in vegetables! I will need to try this recipes out. These look so good. I love kabobs. They are great made in the spring and summer on the grill! I love chicken kebab because of its rich taste. They make a good meal and it’s also just right for the tummy. Perfect recipe for the summer! I just did kabobs the other day, will have to try this recipe! Mmmm this is a tasty recipe that everyone loves. Especially now that it is starting to get warm outside. This is easy to set up and grill. This sounds like a great grilled chicken kabob recipe. It is all ways an awesome summer fun family idea to have a cookout and kabobs are a great food idea for them. Thanks for sharing the recipe. Grilling season is my favorite season. 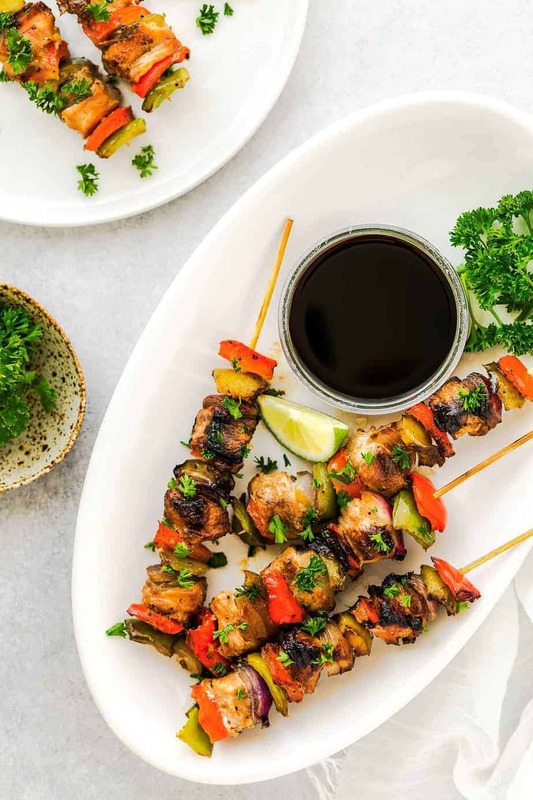 We love making kebabs on the grill and these look delicious. Yum! We love to grill out in the summer and do almost all of our dinners on the grill. Kabobs are a big hit with my family! Wow! I’m so loving this recipe! I haven’t had grilled food lately. I should try this on the weekend. Wow ! love kababs. But only the vegetarian variants 🙂 this looks like a good recipe, will try it out with vegetarian ingredients . I can’t wait for the weather to be good enough to fire up my grill. This chicken kabobs will be the first one on the grill! My family loves our kabobs and we use different veggies and meat to create variety. Oh yum! This looks delicious! My husband and I were just talking about finding recipes for Spring/Summer grilling – this one makes the cut! I wish my food looked this good. I’m going to have to try your recipe because it sounds amazingly delicious. Hands up I love a good kebob I have never tried making my own though! That will definitely have to be next on my list.